New Nautical Coatings, Inc. warrants the Covered Product to be free of all defects in material and workmanship and to deter hull fouling from hard growth including any and all types of barnacles, corals, oysters, or zebra mussels for a period of one year (12 months), from the date of product application by a Certified Sea Hawk Boatyard/Applicator. This warranty extends to the original buyer only. Within the period of this warranty, New Nautical Coatings, Inc. will pay the Certified Sea Hawk Boatyard/Applicator their COST of hauling and blocking the vessel, supply free of charge all Sea Hawk materials to recoat the vessel bottom, supply materials, issue credit, or issue a check as payment for Certified Sea Hawk Boatyard/Applicator COST in hull preparations and all labor time used to repair the vessel. If the vessel cannot be brought back to the original Certified Sea Hawk Boatyard/Applicator, New Nautical Coatings, Inc. reserves the right, at their discretion, to supply product (credit) only. 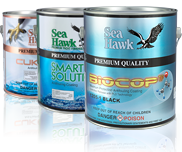 New Nautical Coatings does not warranty paints applied by any persons other than a Certified Sea Hawk Boatyard/Applicator. Paints that have not been properly maintained on a monthly basis. Proper cleaning and maintenance includes but is not limited to: cleaning slime and pollutants from the hull that allow barnacles to grow on the residue which insulates the antifouling properties from growth. Proper cleaning can be accomplished by a gentle rubbing of the hulls surface with a soft cloth or soft car wash wool mitt removing all slime and pollutants exposing antifouling paint. Services or fees not first authorized in writing by New Nautical Coatings, Inc. Repairs necessitated by use other than normal pleasure craft use. Damage resulting from misuse, abuse, accidents, Force Majeure, alterations or improper application, insufficient including but not limited to insufficient paint coverage or rejection of Certified Sea Hawk Boatyard/Applicator recommendations. Corrective work necessitated by repairs made by anyone other than a New Nautical Coatings, Inc. authorized service technician that is a Certified Sea Hawk Boatyard/Applicator. Paints applied by any persons other than a Certified Sea Hawk Boatyard/Applicator. Paints which are damaged due to electrolysis issues. Paints which are damaged due to collision or running aground/ashore. Paints applied to running gear or through hulls. Paints applied over non-compatible paints or substrates. Paints that are damaged due to exposure to toxic substances including, but not limited to, Ammonia, Bleach, Cleaning substances, fuel and oil. Warranty claims that are not submitted within thirty (30) days of first discovery. Warranty claims that are not submitted online at: www.seahawkpaints.com/warranty-claim-form. Warranty claims that do not provide all required information for processing. Repairs performed prior to written approval from New Nautical Coatings, Inc. Repairs performed by any individual or business that is not a Certified Sea Hawk Boatyard/Applicator. In no event shall New Nautical Coatings, Inc. be liable for consequential damages relating to any warranty claim. Some States do not allow the exclusion or limitation of incidental or consequential damages, so the above limitation or exclusion may not apply to the buyer. The buyer should contact the Certified Sea Hawk Boatyard/Applicator who applied the paint for a warranty evaluation. Upon approval of the warranty claim from New Nautical Coatings, Inc. the Certified Sea Hawk Boatyard/Applicator will repair the vessel. If the buyer is unable to contact the Certified Sea Hawk Boatyard/Applicator who applied the paint the buyer should contact New Nautical Coatings, Inc. directly by telephone at 1+ (727) 523-8053 or by e-mail at warranty@seahawkpaints.com. It is recommended that the boat owner ask the Certified Sea Hawk Boatyard/Applicator who performs the warranted paint application to complete the Paint Application Declaration Form at the time the warranted paint is applied. The form can be obtained online www.seahawkpaints.com/declaration. This form should be completed by the Certified Sea Hawk Boatyard/Applicator who applied the paint. Both the boat owner and Certified Sea Hawk Boatyard/Applicator are encouraged to retain copies of the completed form which provides complete details of the warranted paint application and can expedite a warranty claim. This warranty gives you specific legal rights, and you may also have other rights which vary from state to state. You have the right to bring any action at law or equity to resolve disputes concerning or to enforce the provisions of this warranty. If the buyer disagrees over either’s performance under the terms of this warranty, the buyer may submit the matter for resolution to New Nautical Coatings, Inc. at 1+ (727) 523-8053. The buyer is required to submit any dispute for resolution under this paragraph before pursuing any legal remedies to which he or she may be entitled. “I thought that I would let everyone know that Sea Hawk paints honored our warranty claim. In fact, we did not have any problems what-so-ever with the claim process. Both Denis and Cheryl at Sea Hawk where good to deal with and professional in every respect. All I had to do was submit my receipts showing the purchase of the paint, the invoice for the paint application, as well as some photos showing the premature ablating. It is nice to see a company stand behind its product.